Carers working sleep-in shifts must be paid the minimum wage after another victory in the courts for Unison. The union successfully used employment tribunals to change government guidance on the application of minimum wage legislation. As we should have expected, the Tory government’s response has been disgraceful. Instead of ensuring that care staff receive the back-pay they are owed, government has cynically passed the buck to providers and kicked the can down the road for at least another 15 months. This reveals the true nature of the Tories – claiming to be the party of hard working people but leaving low-paid care workers in prolonged uncertainty. My father is a care worker. I’ve always been amazed at the amount of energy he puts into what is a difficult job, the warmth he brings to it and the incredible effect he has on people every day. He deserves to be paid a fair wage for his work. Sleep-in shifts – so-called because people who can’t be left alone through the night hire carers to stay in case they are needed – can be some of the toughest, often caring for individuals with complex needs. Highly vulnerable people are often provided for through local authorities, who contract providers that offer specialist care services. Austerity has squeezed local authority budgets – meaning in many places payment for carers has remained static since 2010 despite higher pension contributions, higher regulatory fees and the minimum wage changes resulting from the Unison victory. The Tory government simply isn’t passing adequate resources onto local authorities. The government’s own guidance previously mistakenly instructed providers that paying overnight carers less than the minimum wage was okay. Now, this lack of funding is essentially the Tories not respecting the decision in favour of low-paid carers. Even the chancellor’s own local authority has been found not to be paying the higher rate to meet the minimum wage for sleep-ins to at least one of their contracted providers. Now, we are left with a situation involving care providers, many of them charities, who say that despite wanting to pay staff more they simply cannot afford to foot the bill for six years of unexpected back-pay, carers who deserve their fair compensation, vulnerable people and a dithering government. This is the same Tory government which has for the last two years failed to admit their mistakes, failed to correct the system they created, failed to properly fund the social care sector and failed to ensure this back-pay to hard-working carers. The care sector has estimated costs of £400m to pay back staff. Instead of raiding charity coffers to pay for essential services, the government needs to take responsibility for this plight they have created and fund the £400m. When will we have justice for some of the hardest-working among us? Stephanie Peacock is MP for Barnsley East. 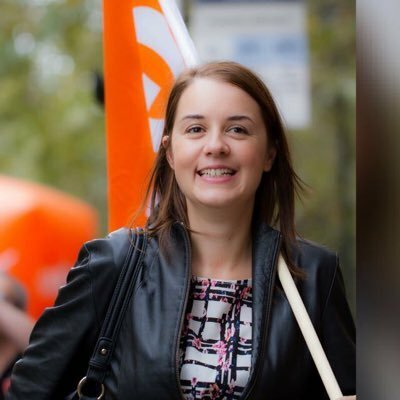 Steph Peacock is Young Labour's representative on Labour's NEC.